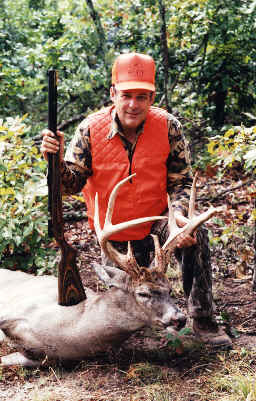 THIS IS DOC WHITE WITH A FINE 140 CLASS WHITETAIL TAKEN DURING AN EARLY SEASON WITH A LAMINATED STOCK WHITE BISON IN 54 CALIBER. An original production WHITE Bison rifle. Bison rifles may be found with any of the stocks found on the Whitetail. All were the best bargain in muzzleloading, being accurate and hard-hitting with reduced recoil. Stock design was functionally elegant. THIS WHITE BISON WAS BASED ON THE G-SERIES ACTION, SAME AS IN THE WHITETAIL, AND WAS PROBABLY THE MOST STABLE RIFLE THAT WHITE EVER PRODUCED. FEW OF THEM EVER COME BACK, PROBABLY BECAUSE OF THE STRAIGHT BULL BARREL. THEY ARE ALMOST ALWAYS SUPER ACCURATE. ODDLY, THEY WERE THE NEXT TO CHEAPEST RIFLE PRODUCED (the White-Lightning was the least expensive), AND WERE A REAL VALUE FOR THE MONEY. FEATURES ARE SIMILAR TO THE WHITE WHITETAIL EXCEPT FOR THE HEAVIER BARREL AND DOVETAILED SIGHTS. THE REAR SIGHT IS A WILLIAMS ADJUSTABLE, THE FRONT IS A BRASS BEAD. THERE AREN’T MANY AROUND AND WHITE MUZZLELOADING SEES ONLY A FEW. WANT ONE?- DOC WHITE HAS AQUIRED A FEW .504 CALIBER BARRELS AND STOCKS AND WILL ACCEPT CUSTOM ORDERS. EMAIL HIM AT doc@whitemuzzleloading.com for price and availability.